I often see a piece of clothing (either in store, online or on a stranger) and think to myself "I can make that". Does anyone else do that? Sometimes I will do this out of necessity; the item is sold out or cost prohibitive to purchase. Other times I'll do it to suit my preference of say a different color or print or to tweak the fit or design. Still other times I do it just because I can. This was one of those times. This dress was inspired by a dress I saw Mimi G share from Urban Outfitters. 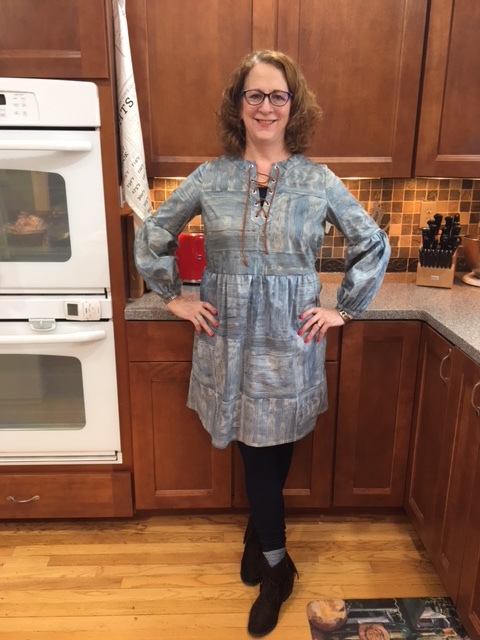 I love a linen dress and this one is so cute I had to have it. Though I could've easily purchased this dress, I decided it would be more satisfying if I made it. Since I've worked with Fabric Mart's Designer Linen before (here, here and here) I knew it would be the perfect weight for this dress. And though I thought of making it in one of the other 22 colors available (Urban Outfitters offers it in a lavender and two prints) the white just screams spring and summer to me. I did the whole shoot with out realizing that I didn't button up! 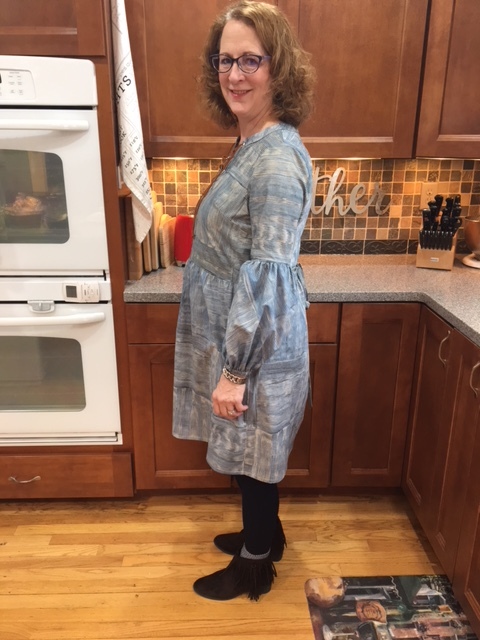 This is an easy enough dress to draft from scratch, but I decided to use McCalls 7688 as a starting point (I'd previously sewn it here). M7688 had the basic shape I needed; crew neck and drop sleeve. Really any loose fitting drop sleeve top or dress pattern would work (M7712, M7721, S8529, S8656 are all good options). This would also be a great pattern to attempt to self draft as you really just need your bust, waist and hip measurements. I did have to make some modifications and the biggest one was making a woven garment from a knit pattern. Though the reverse (woven pattern to knit garment) is typically quite easy, knit to woven can be tricky. 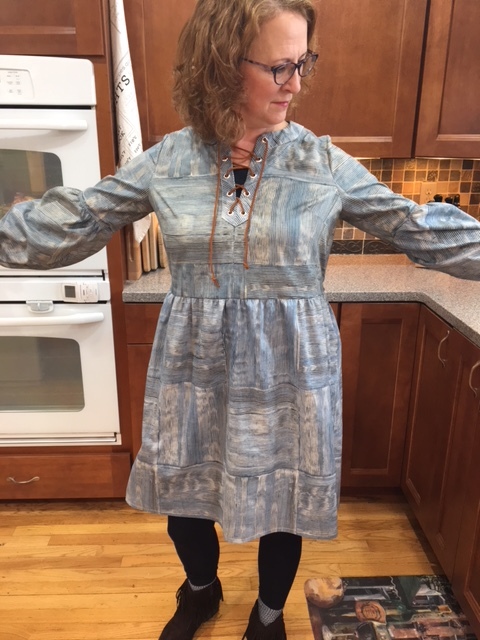 I knew it would work here because I was looking to create a very loose fitting dress. Essentially I just went up a size (check your finished measurements) and cut the back piece in two pieces (don't forget to add seam allowance) to create the keyhole opening so I could get in the dress! Lastly I finished the neck opening with single fold bias tape because a neckband would not work. lengthened the dolman sleeve by 2"
I had to play with the sleeve length and underarm curve but after about 3 tries I got it how I wanted. Other than that it was pretty simple. 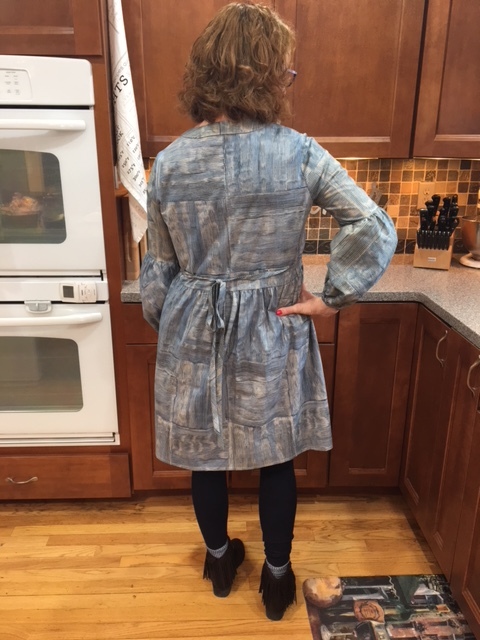 After I sewed together the main dress, I finished both short edges and one long edge of the shorter strip, sewed the short edges together and gathered the unfinished edge until it was the same diameter as the sleeve. The bottom ruffle was created the same but I sewed the two long strips together in a loop before gathering. 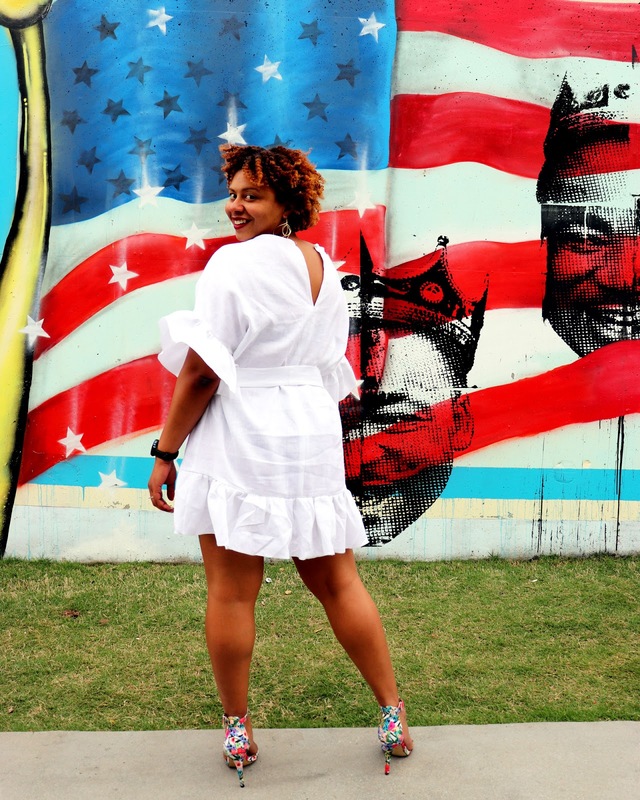 For now I can't wait for someone to throw an all white party or maybe suggest a girlfriend brunch so I can wear this out. Hey guys! It's Elizabeth from Elizabeth Made This, and I'm so pleased to be popping in here on the Fabric Mart blog every once in a while. Today I'm sharing my first project. Spring is in full swing here in Colorado, which means that linen season is upon us! Linen is one of those fabrics that is as much a treat to work with as it is to wear, especially when the weather starts to warm up. 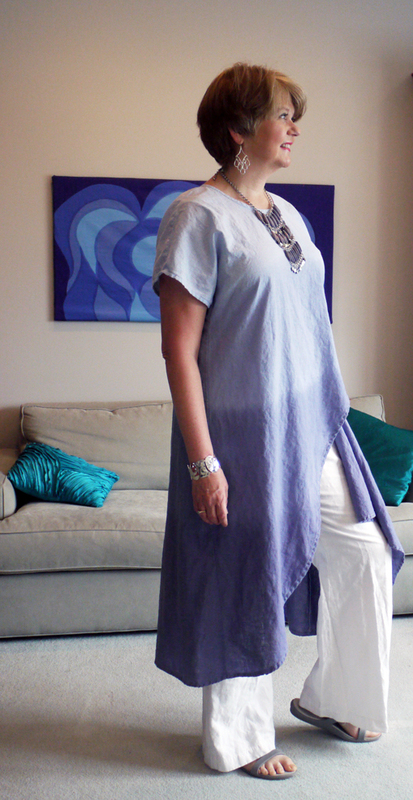 I took full advantage to glory in linen love with this dress, choosing the lavender Designer Quality Linen. While I think that this soft purple is perfect for Spring, there are tons of other colors of this fabric. 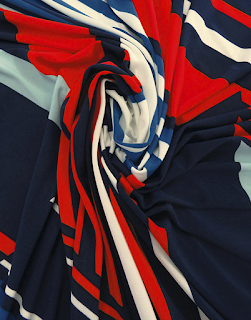 It has a lovely drape and a good heft to it like all really beautiful linens, so I know you're in for a treat no matter what color you choose. From the outset of this project, I was bent on recreating Milly's denim linen apron dress. 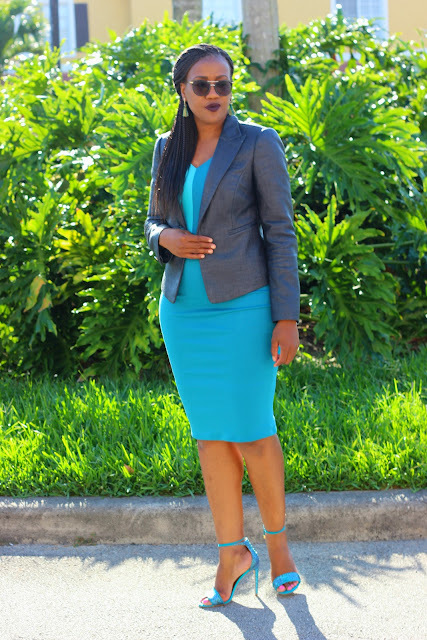 I love the mermaid shape and the raw hem details. There's a lot of cool contrast in this dress between the sleek, fitted upper part to the flouncy jagged edges of the swishy skirt. To say that I had all the emoji heart eyes for this dress was an understatement. For the bodice of the dress, I chose Burdastyle 11-2010-117. It's a great bodice for any kind of summer sundress style, though the full, gathered skirt was not going to work for this particular knock off. Instead, I self-drafted a rather short pencil skirt for the middle portion of the dress and an equally short circle skirt for the bottom section. No doubt my version is proportionally shorter in all 3 sections that the Milly dress, clearly worn by a model who is not 5'2.5" as I am. For reference, each of my skirt portions are 12" in length. Typically, I prefer shorter skirts, but this was a good compromise to get the feel of the wide hem drapes. To create the drapes for the lower skirt, I cut 4 full circles the same size as the circle skirt, but only 4" in length. There's a 5th drape that is just a half circle that is on top. In studying the original dress, It sure looks like the drapes make up the entirety of the lower skirt which might explain the extreme angles. I opted for something a little softer and simpler to construct. The drapes were hand-basted to the lower skirt while it was flat. They overlap each other in a rather freeform manner. To anchor them to the skirt, I zigzagged the top of each drape to the skirt. 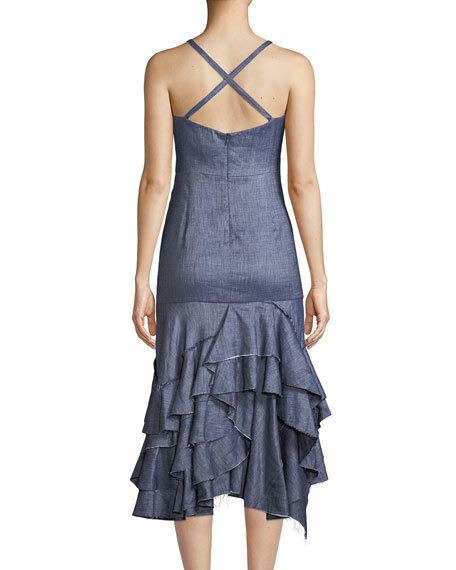 The original dress has a crossover design to the back on the shoulder straps. I opted for ties instead. Because linen relaxes in the wearing, I didn't want straps that would be at the right level one right after washing, and drifting down past the point of comfort another day. I've tied them in the crossover shape here, but you can also tie them straight in the back or even in a halter configuration. One of my favorite properties of linen is how it frays. 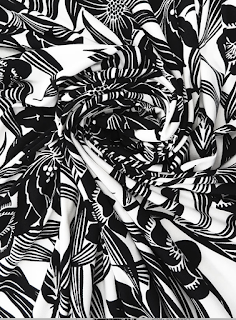 There are some fabrics that fray in a rather wild, uncontrolled, messy manner. Linen's fraying nature on the other hand can be a beautiful thing that you can manipulate to your advantage. Incorporating a little bit of fringe into my linen projects is something I do frequently, so here's the low down. 1/2" from the raw edge of both the lower skirt hem and the drapes, I sewed a 2.2mm straight staystitch. Next I sewed a 6.0mm width, 1.0mm length zigzag 5/8" from the raw edge. It's not 100% necessary to add a zigzag stitch. A straight stitch is totally sufficient for any fringing work you want to do, but I rather like the added decorative nature of the zigzag. Next comes the fringing, and on this dress, there's no less than 12 yards worth of it! Fringing comes down to pulling out the horizontal threads so that the vertical threads create the fringe. Making the best fringe comes down to controlling how you pull out threads. It's the work of a little patience, but a nice thing to do while watching a movie. 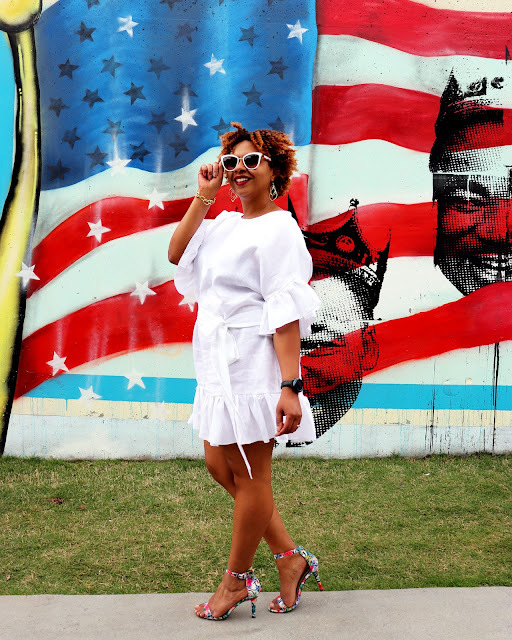 Here are some tips for creating some fabulous fringe. Use a sharp needle or a straight pin to begin the fraying process. Insert the needle about 3/8" from the raw hem edge and pull gently towards the raw edge. Some threads will loosen. Continue this motion, inserting the needle into the fabric ever 1/4" or so, teasing out the loose threads. Don't worry at this point if some are longer than others. It will be tempting to start pulling all of the threads that come undone, but if you do, the fraying could become uneven or worse yet, you might make the hem look positively bald in places. Restrain yourself and just keep pulling out the threads with the needle. The nice thing about using a needle is that it tends to keep the threads from fraying past where you insert it. Fraying on edges cut on the straight grain are easy, but what about the bias? Because the warp and weft threads of linen come together like most woven fabrics at a 90 degree angle to each other, there's no bias threads to speak of. In theory, you could end up with a hem with holes in it right where the bias comes into play. To fake it, just keep teasing out the threads with your needle. When you get to a bias section, gently move the straight grain and the cross grain threads so that they fill in the space evenly. Be careful not to pull out the threads too much in bias areas. Keep fringing as much as you'd like. 1/4" to 3/8" is a nice length for most applications, and longer fringe is great for more drama. Apply a fray blocking liquid like Fray Block or Fray Check right where you want the fringing to stop. These liquids dry clear and they'll make it so you can launder your fringed project without the fringe suffering too much. To be careful, I always wash my fringed projects on cold on a gentle cycle and let them air dry. Do you love linen? Have you ever incorporated fringe into any of your projects? Made by a Fabricista: Easy Ponte Knit Pencil Skirt or Dress! 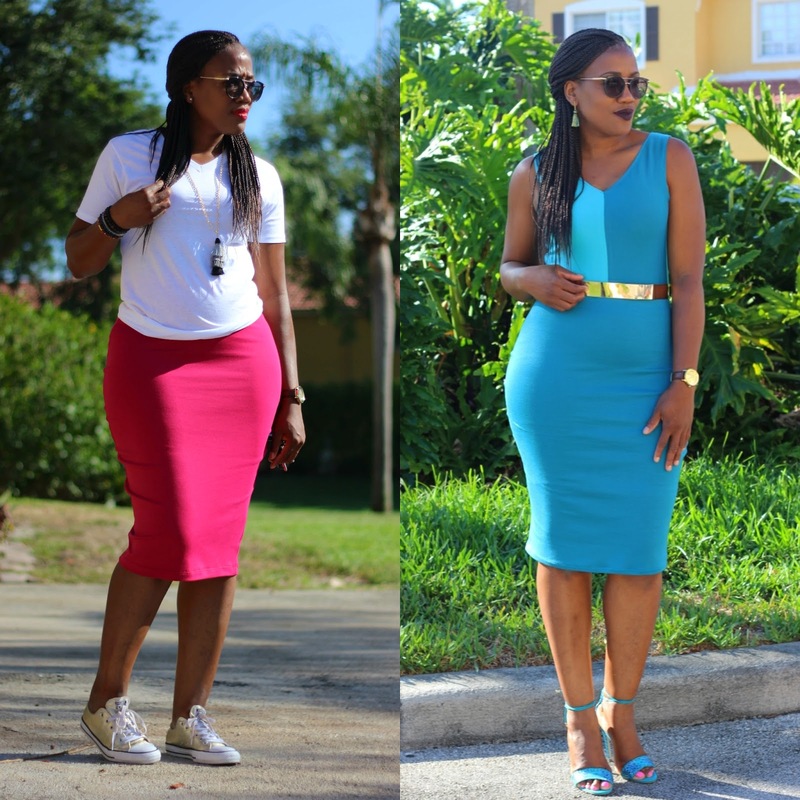 One hour or less, Ponte Knit pencil skirt or dress! Have you ever created the perfect plans mentally, sketched it on paper and ready to start and then something happened and you lost the desire to create it? 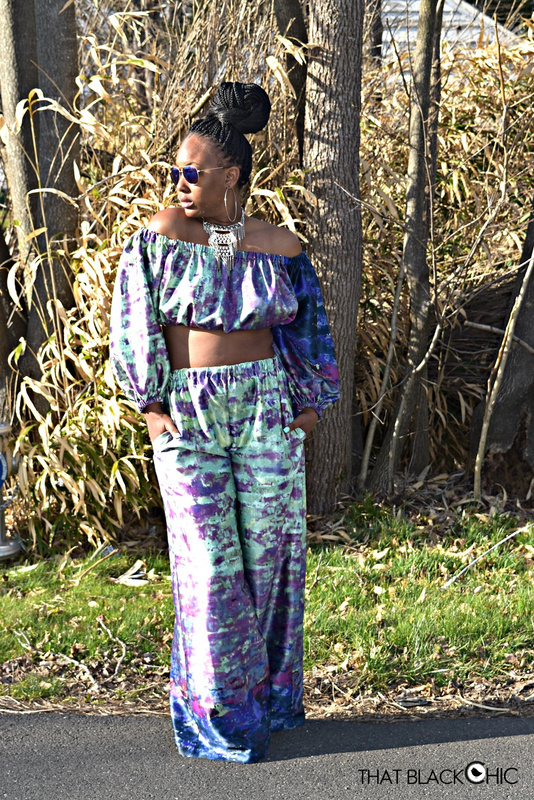 Lately, I have been uninspired to sew projects that will take more than an hour. The last 2 weeks I honestly lost my sewjo and I truly need it back to get ready for Spring/Summer. Teaching these last few weeks have been hectic as I have been preparing the students that I teach and my children for the Mathematics end of year state exams. I have been so exhausted and the past few weekends I have only completed easy sewing projects that would take an hour or less. I am counting down the days to this year's summer break (perks of being a teacher) where I can truly travel, relax with my children and sew more. I am excited and looking forward to my first Sewcation event planned at the end of July with other sew sisters (Check out my blog here for more details or follow the page on Instagram here). Sewing in my own world has NOT been fun lately and I wish I had a sewing group to connect and meet up with at least once per month. I really wanted to hack a few patterns and make a mommy and me look but all the plans were sidelined after having a failed peplum top using this bodice. 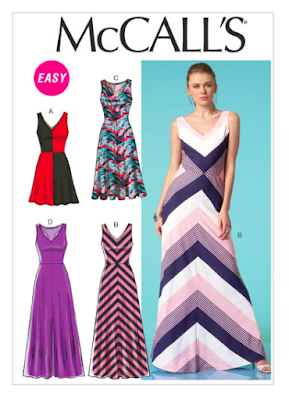 I love this pattern especially the bodice and maxi dress views with the color blocking option. 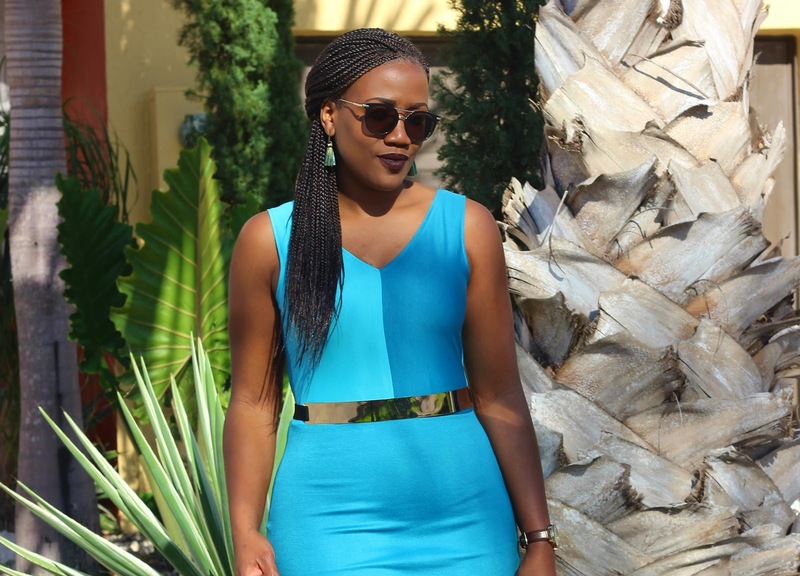 With the great fit of the bodice, I had to save it and create a bodycon dress. 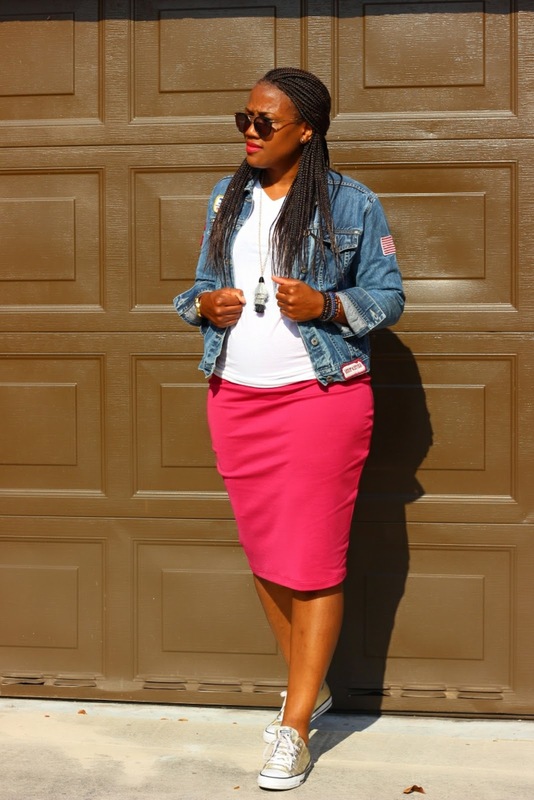 The bodice that I use was McCall 7121 which is so versatile and fun for color blocking. I am thankful that I had extra fabric to work with as I do not create muslin and I tend to make adjustments directly on the pattern. 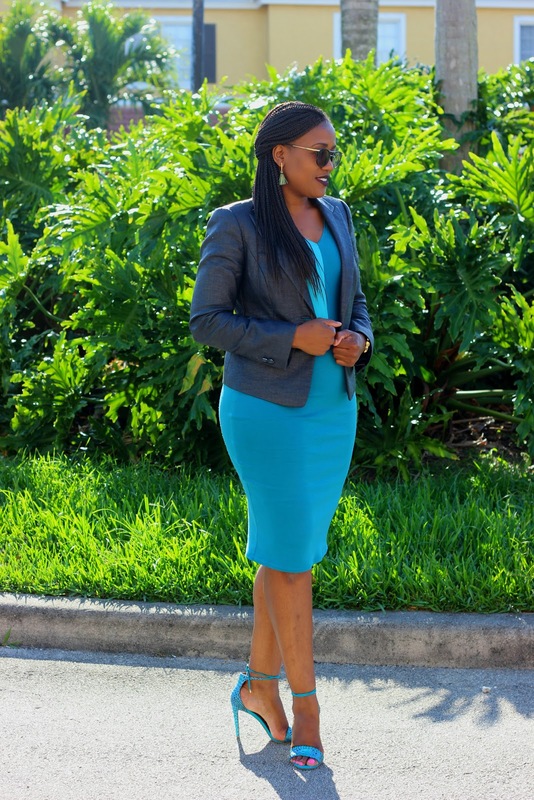 This bodycon dress came out better than I imagined and with the perfect shoes in my closet, it was icing on the cake. I actually draft all my pencil skirts directly on the fabric using my tape measure, curve, and my quilter's ruler. I love dresses that are perfect and versatile for different occassion such as an outdoor wedding, a business happy hour event or even a date, so I opted for a sleeveless look that I could rock with a jacket, kimono or totally by itself. 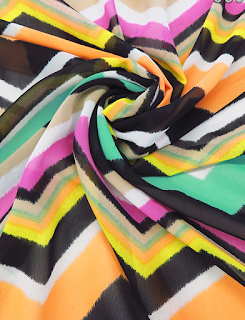 Fabric Mart has a variety of spring and summer colors in Ponte knit fabric here which are perfect for maxi or body con dresses, pencil skirts or a more structured or fitted look. 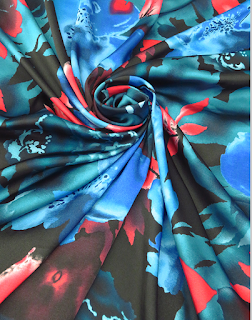 I always grabbed a few yards when they have the great deals in a variety of colors as I truly love working with Ponte knit versus jersey knit. 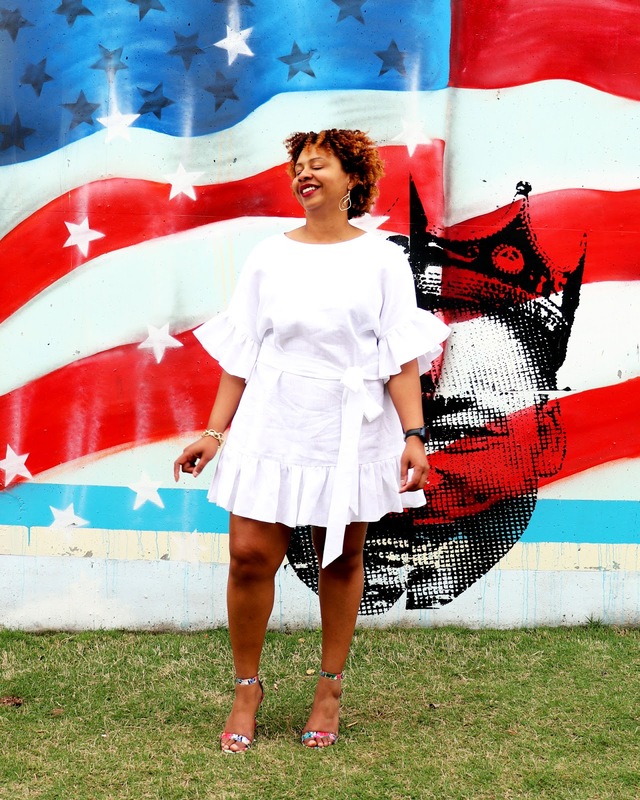 This summer, I plan to create more everyday garments such as jackets, pants, skirts, and dresses using more structure knit that I know I will wear more than once or twice. Pencil skirts, tees, and tanks are my favorite to wear during Spring/Summer months and it has been a few months since I created one. 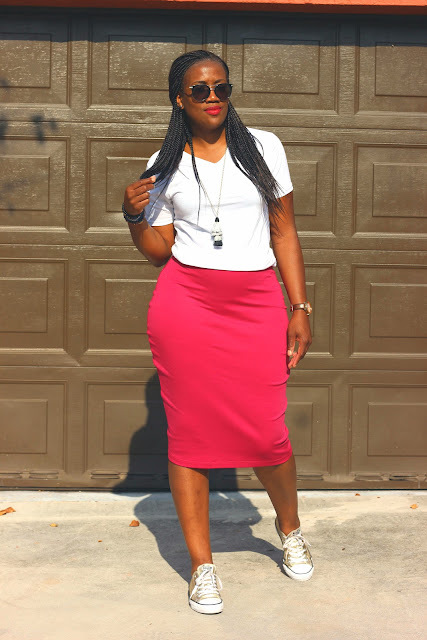 Saturdays are my days for errands and a pencil skirt with converse goes a long way. What are your sewing plans for the Spring/Summer season? Do you sew more or less during these months? Thanks for reading and don't forget to stop by the BLOG and check out the details for the Sewcation 2018 event!! For a more dressy look, I paired this with a skirt (which I will never wear anywhere since I have no where to go :), but it is so cute! Do you have spring fever as badly as I do? 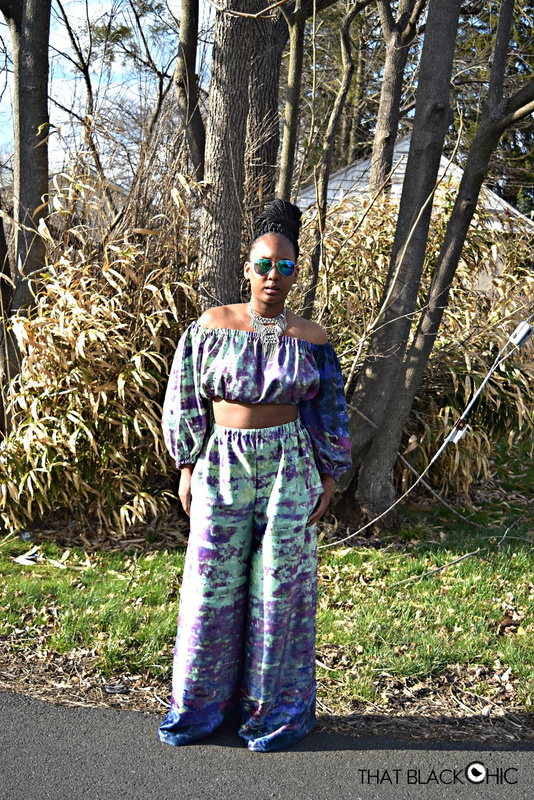 To break that fever, I try sewing for spring and this make didn't disappoint me. I used this lovely fabric from Tori Richard's. It is a plaid shirting which seems to be sold out but there are other great options here: Shirting fabrics. 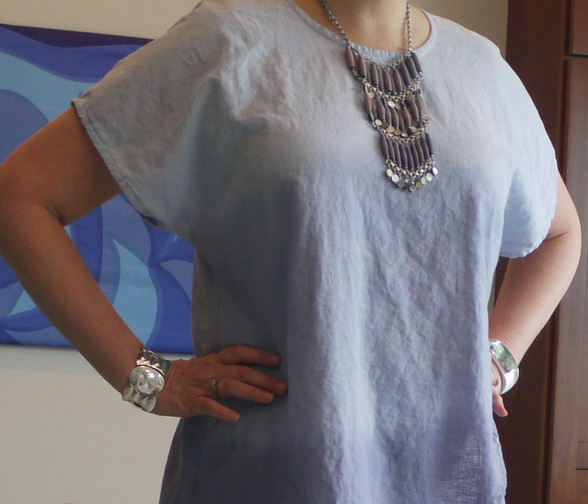 Shirtings, especially cotton ones are so wonderful to work with. I love natural fibers. I used a Simplicity pattern for this dress that you can see here: Simplicity 8551. It was an easy sew. Don't be afraid of adding hardware to your makes. For the placket, I folded it in half, lined up all the edges and then used an awl to punch holes for the grommets. That way, I knew they would match up perfectly on each side of the bodice. Playing with the plaid was half of the fun! As you can see, the placket is cut on the bias as well as the lower sleeves and the waist ties. Since this plaid is so big and uneven, I didn't really worry about matching it. I don't think that was a mistake. This was a fast and fun make. I hope the weather cooperates soon so I can wear this without leggings and booties! Thanks for reading--Sue from Ilove2sew! It's April and we're expecting snow tonight. Have we switched hemispheres? Nevertheless, I am sewing with visions of warm sunny days. And for those warm sunny days to come, I imagine sitting in the shade with a light breeze flowing through the air, enjoying a light beverage with friends. Just close your eyes and you can imagine too. What would you be wearing? 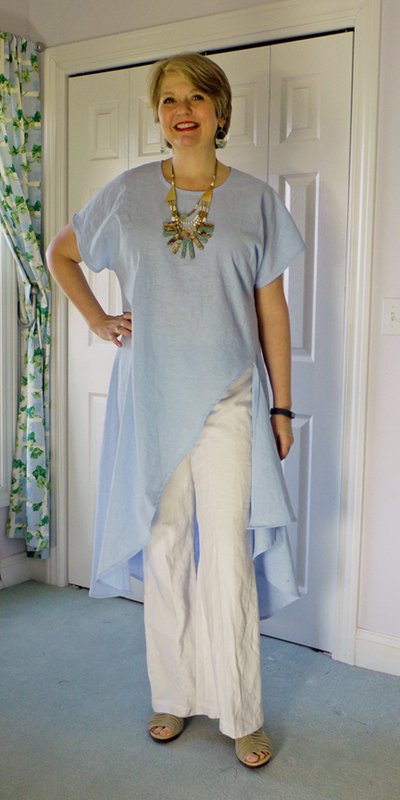 Well, I love a dramatic asymmetrical tunic made of the softest linen. As luck would have it, I found just the fabric in the "As Is" section in Fabric Mart's sales category. With just some irregular dye marks on the selvage, it was marked down, but still completely usable. It started out as a solid color, but I did an ombre dip dye process to get this look- more on that later! 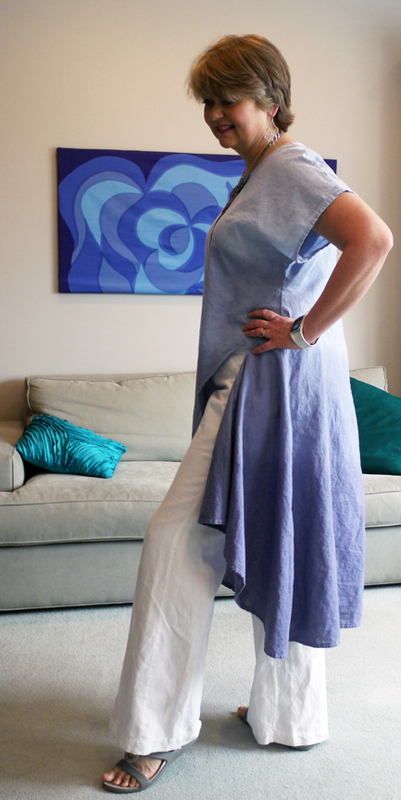 For my pattern, I chose Vogue 9305, a tunic with a shaped hemline, and two styles of pants (I didn't make the pants). This pattern must be the biggest bang for your time possible. 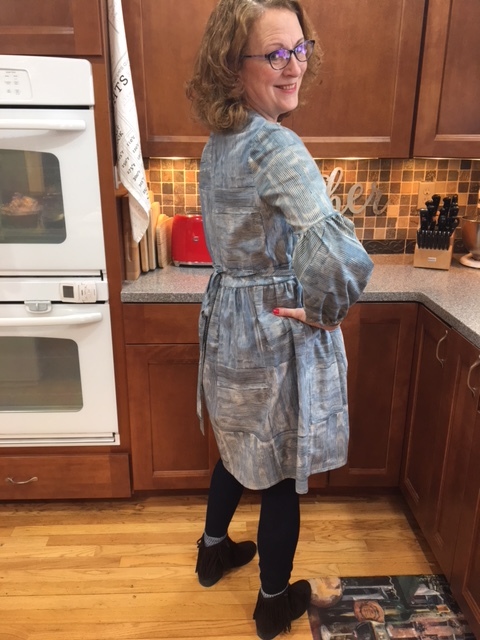 The tunic went together so quickly- that little flounce on the front hem is deceptively simple- you would think that there was some very tricky construction, but it's just a short seam sewing the lower side section to the upper section, and then the rest is narrow hemming. Sometimes, fabrics are difficult to narrow hem on a curve, but this linen behaved beautifully. It really was a joy to work with. I lowered the neckline by 2 inches, using a french curve to make sure that it had a nice rounded shape. That allowed me to slip the tunic over my head and not worry about fiddling with a button closure in the back. 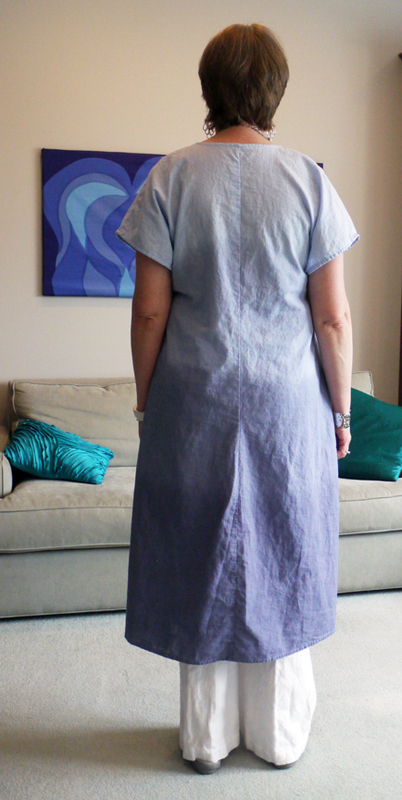 I also lengthened the tunic 1-1/2" for my 5'9" height, but I'm not sure that was necessary- it's very long as is! I particularly like how the side piece falls when sitting. I liked it, but in the photos, it reminded me a bit of a hospital dressing gown, and I said "No, no, no,no, no!" So, I mixed up just about a tablespoon of liquid navy dye and 1/3 cup of salt in some hot water in a 5 gallon bucket. I sectioned the tunic into 4 sections using rubber bands. I first wet the fabric with hot water, so that it would dye more evenly. Then, I dipped the first section into the dye, and cut the rubber band off for it's section, swirling the section around in the dye for about 3 minutes. Then I did the next section for about 2 minutes, and then the third section for about 1 minute. 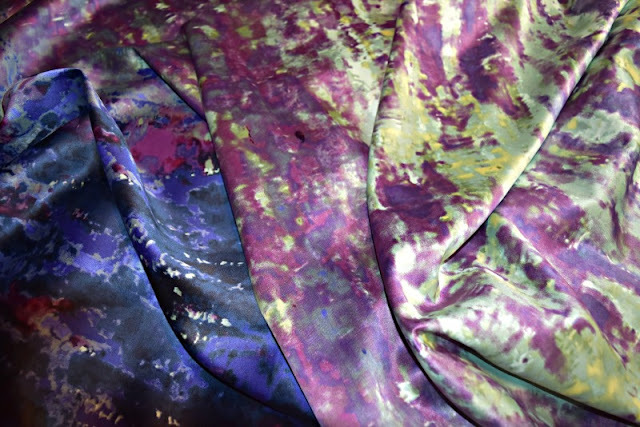 Just to clarify- the previous sections stayed in the dye while I did the new sections, so total time for the first section would be about 6 minutes, the second section about 3 minutes. Usually they recommend that you dye things for up to 30 minutes, but I really wanted just a very faint color here, and that's why I shortened the time. The last section is very light- here's a close-up so that you can see it. I did not dye the top section, but covered it with a plastic bag, so that if anything splashed up on it, it would be protected. Then I rinsed, and washed the whole garment, hoping for the best. So the texture you see here is of washed linen, with no pressing. Slightly crumpled- but that's fine for me- I think it makes it look more interesting. Here's the back and side views. I love the result, and am so happy that I tried it! 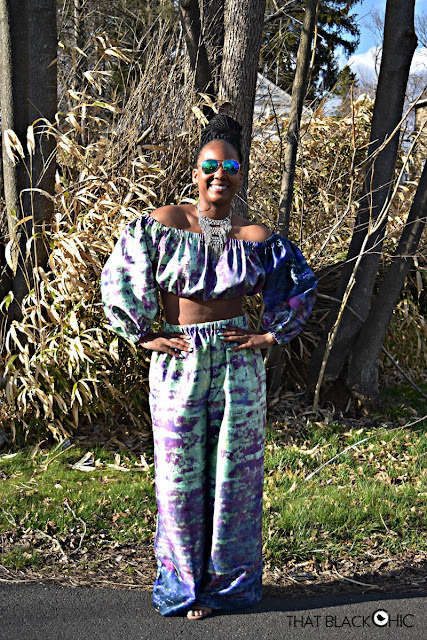 Have you started sewing yet for warmer weather? Linen is great for warmer weather as it breathes so well and it resists odors. It's hard to find in ready to wear clothes, and usually expensive if you do find it. 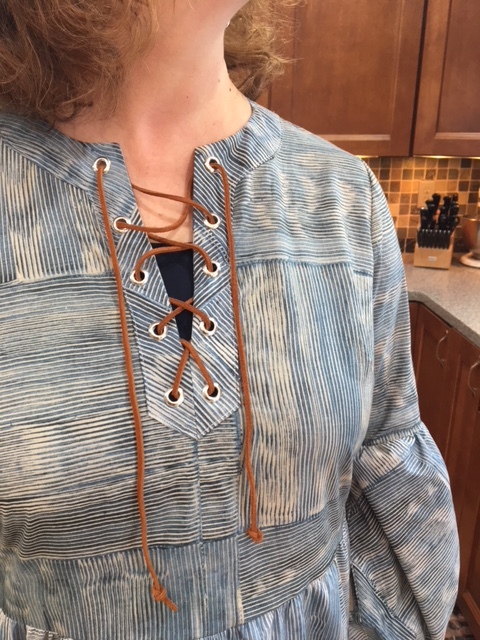 If you haven't tried sewing with linen yet, definitely give it a try! Spring is here!! Although here is Pennsylvania it’s hard to believe with all the snow and coldness outside. But we’re going to pretend or let’s just say we’re getting ready. 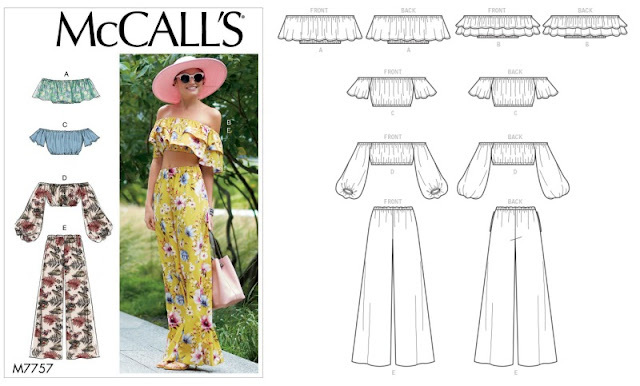 McCall’s M7757 is going to be the it pattern, I can feel it in my bones. 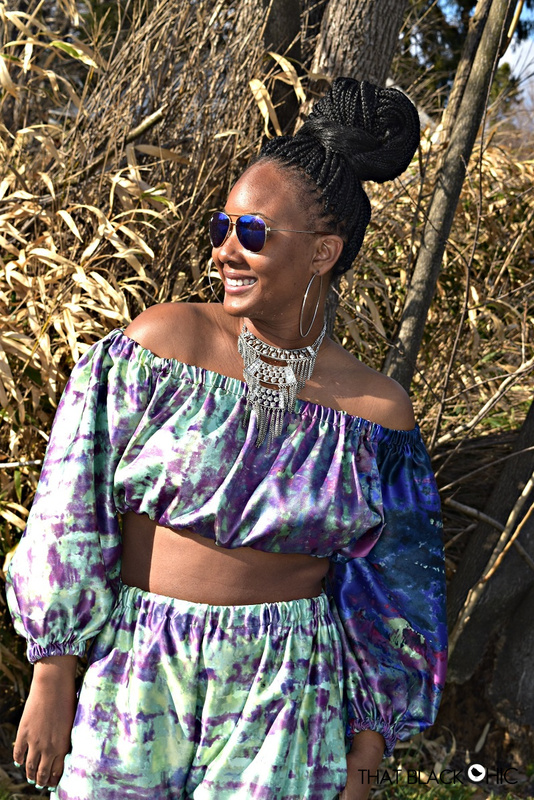 The pattern is so cute, it shows of the shoulders and it’s an easy make, those are all the qualities that will make it a go-to pattern this spring. I ordered this gorgeous fabric more than two months ago and it was supposed to be for my February post on the blog. I waited until the last moment to open the package and when I did it totally wasn’t what I expected in structure and weight. I thought the fabric was more like a twill or more structured Sateen. I had plans on making a pant suit with this fabric. So, I had to put it on hold until I could figure out what to make with it. 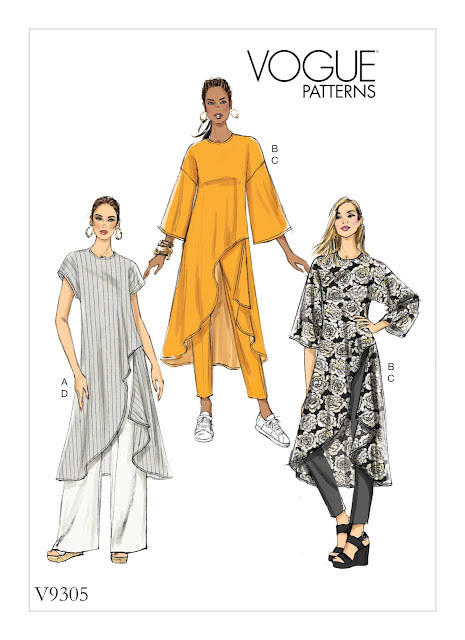 The print is fantastic (Mori calls it a galaxy print) and I thought about making myself a pair of fancy pj’s or a maxi dress for Mori but then comes along the release of the new spring patterns from McCalls’ and I chose McCall’s M7757. This is an outfit can be put together in under 2 hours, giving you plenty of time to make more than one. 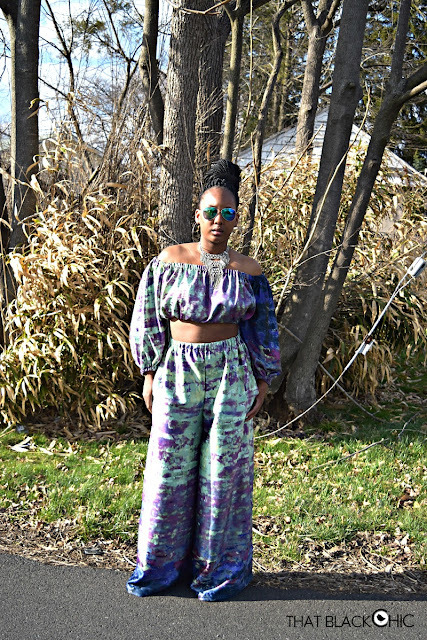 The Palazzo pants are super wide. Mori is 5'7 and I had to add 3 inches to the length so that she could wear heels with the pants. The original length is good for flat sandals. 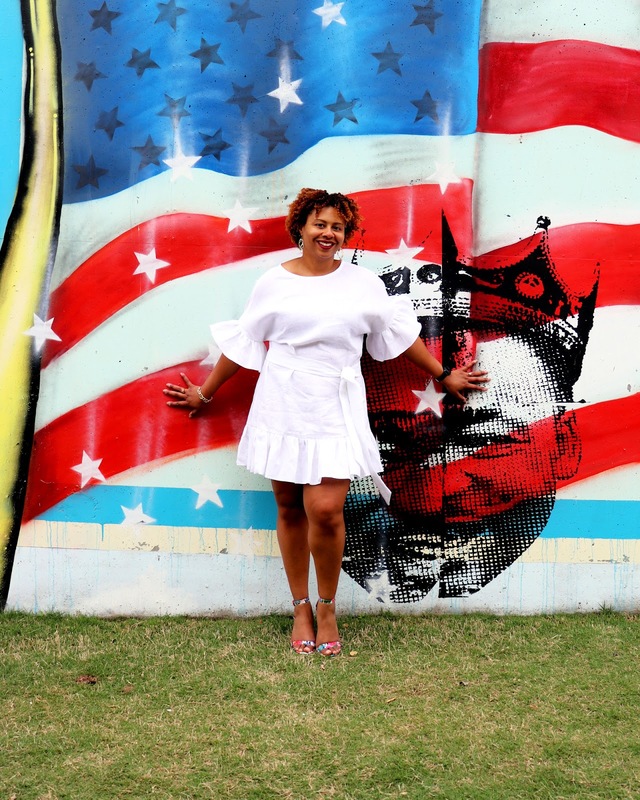 Here are a few great options if you want to make a bold statement! I will definitely be making a few more of these for Mori, I just have to stock up on elastic! Have a great day Peeps and as always it's been a blast to share my work with you. Don't forget to stop by and visit me sometime!